Over the years, Happy Thanksgiving and turkeys have become unanimous. Welcome to our turkey recipes page, where you will find quite-a-mouthful of delicious preparations to try your hand on, and make a very special dinner with your family. There are roasts, sandwich, bakes, and even candies. You can also save the page in your computer by clicking on the top left file menu and choose 'save as'. Click Here for a short history of how this bird got associated with this festival. The oven should be preheated to 325 degree F.
Fill up the cavity of the turkey breast with butter and also rub the turkey properly with the butter. Use salt and pepper generously. Sprinkle the vegetables on the pan and keep the turkey on these scattered vegetables. Place the Turkey meat breast side-up. Roast the meat for more than 2 hours or keep an eye on the temperature which should be 160 degree F.
Use a cutting board to keep turkey meat and wrap loosely with foil for 30 minutes. Let the temperature to climb up to 170 degree F.
Keep 3 tablespoons of the fat and discard the rest. Include juices to stock as well. Place a burner and set it over medium heat after adding the reserved fat to the roasting pan. Use a wooden spoon to scrape up browned bits if any. Stir it with flour while you cook it for 2 more minutes. Whisk in the stock and continue to stir this at the same time. Boil it for 3 minutes until thick. Strain the gravy clearing the vegetables. Slice the breast before serving it with gravy. For every 1/2 cup turkey drippings, 7/8 cups of hot broth. Take a glass measuring cup and transfer the turkey drippings to it. Add ½ cup of white wine or broth to a roasting pan and heat it in low temperature. Don’t forget to scrape the bits from the pan. Glide ½ cup fat from the drippings and place in the roasting pan. Stir and add ½ cup flour to the fat in the pan. Cook until the combination takes brown color. Gradually beat the hot broth into the roux. Include drippings and cook to clot. Salt, pepper and chopped giblets can be added. Neck and giblets should be taken out of the cavity. The liver should be ditched and rest of the giblets should be reserved. Use paper towel to dry the turkey. Season it properly with salt and pepper. Use chopped onions, carrots, apples and herbs to fill the turkey. Roast it for approximately 2 hours tenting it with foil. Use more melted butter to brush it. Again heat the roasting pan on 425 degree F.
Continue roasting it for another hour. Set it aside while you are busy making the gravy. Remove the giblets from the turkey. Use a 54 quart cooler and combine salt and hot water. Stir it to dissolve the salt. Stir while you put vegetable broth, honey and ice. Cover it with cooler lid. Heat it for 12 hours. Dry thoroughly after removing the turkey from brine. Rub vegetable oil on the turkey. Heat it on 400 degree F.
Use a thick aluminum foil. A cup of hickory wood chips should be placed in the centre of the foil and collect the edges making a small pouch. Don’t forget to leave the pouch open at the top. This should be placed directly on the metal bar over the gas flame. Set the turkey on 160 degree F.
Cook for an hour closing the lid. Check the color (should be golden brown) of the skin after one hour. Continue cooking covering it with aluminum foil. Replace wood chips with second cup after 1 hour. Once the temperature of the turkey reaches at 160 degree F, remove it from the grill quickly. Cover it now with aluminum foil. Set it aside for one hour. Slice and serve it to guests. Place the turkey wings and drumsticks into a 3-quart oven-proof dish, keep aside. Take a saucepan and fry onion into hot oil for about 2 minutes, until brown. Add brown sugar and simmer over medium heat for 2 minutes, keep stirring. Add lemon juice, Worcestershire sauce, catsup, Dijon mustard, chili powder, and Tabasco sauce, mix well. Pour the sauce over wings and drumsticks. Cover it and bake into preheated oven for about 1 hour. Uncover and bake for about 35 minutes more, till the wings and drumsticks are tender and juicy. Combine all the marinade ingredients in a food processor or blender and blend it for about 5 minutes. Fill a syringe and inject it into each turkey in the breast, thigh area, as well as the back, wings and legs. Mix the seasoning ingredients and massage the mixture evenly all over each turkey. Put the turkeys in big plastic bags and secure before refrigerating them for about 24 hours. Fill a big pot three quarters of the way full with the peanut oil. Heat the oil to between 350 and 360 degrees F.
Put 1 turkey in the basket carefully and gradually lower it into the hot oil. With a long-handled fork, turn the turkey every 10 minutes. Cook it until the internal temperature reaches 170 to 180 degrees F on an instant read meat thermometer. A whole turkey will take 3 to 5 minutes per pound to cook. Now carefully lift the basket out of the hot oil by inserting a broomstick through the handles and having two people lift the basket out of the pot. Using the long-handled forks, transfer the turkey to a big brown paper bag and let stand for 15 minutes before removing to carve. Repeat the same process for the second turkey. Carve the turkey and serve it. In a large bowl, make a mixture of chili sauce and cream cheese. Spread this mixture evenly on one side of the tortillas. Add, with spoon, a bit of each of the other ingredients - the lettuce, the green onions, coriander and olives - on top. Roll the tortillas snugly and cut into half. Serve with salsa. The day before, remove giblets and any lumps of fat from the turkey cavities. Rinse the turkey properly and blot dry. Season the inside with salt and pepper and loosen the turkey skin from the meat. To do this, begin at the neck and tunnel your fingers, then whole hand, under the skin to separate the skin from the breast meat. Slide your hand down to loosen the skin over the thighs, drumsticks and back carefully, so as not to tear the skin. For the marinade, mash the garlic and salt in a mortar to make a fine paste. Add pepper, cumin, oregano and all the lime juice or sour orange juice and puree the ingredients. Now add 3 tbsp marinade to the main cavity and 1 tbsp to the neck cavity. Put rest of the marinade under the skin and work over a roasting pan to catch any runoff from the marinade. Keep the bird in a big plastic bag with any excess marinade and marinate the turkey overnight into the refrigerator, turning some times. Thinly cut the butter and put half of the slices under the skin. Melt rest of the butter. Tie the turkey and put it on a rack in a roasting pan, breast side up. Brush the skin of the turkey with some melted butter. Loosely drape a big piece of cheesecloth over the skin and pour rest of the butter and marinade over the cheesecloth. Roast it for about 2 hours and baste it with the juices and butter that gather in the pan. Lift the cheesecloth from time to time to keep it from sticking to turkey. Raise the oven temperature to 350 degrees F and roast for about 1 hour. Now again raise the heat to 400 degrees F and take away the cheesecloth from the turkey. Roast for about 15 to 20 minutes, basting often. When cooked, the skin will turn to golden and the leg juices will run clear when pierce with a fork. The internal temperature should be 185 degrees F on an instant-read thermometer and the drumstick should loose when wiggled. Shift the turkey to a tray or cutting board. Let stand for about 15 minutes before carving. Now strain the pan juices and serve it on the side. Sprinkle the turkey inside and outside with salt and pepper. Put wings under the turkey and place the turkey in an oven roasting bag. Spread onions, celery, turnip, carrots and garlic over and around the turkey. Fold the top of the bag over and keep the turkey breast up, in a small roasting pan. Now add water to a depth of about 1 inch. Roast turkey for about 3 -1/2 hours till a meat thermometer inserted in the thickest part of the leg , reaches 165 degrees F to 170 degrees F.
Carefully tear open and take out the bag. Roast 30 minutes longer till the thermometer registers 180 degrees F, basting with the pan juices every 5 minutes till golden brown. Remove the roasting pan from the oven and carefully shift the turkey to a serving dish. Letting the juices run back into the pan and reserve the juices for gravy. Cover the bird with foil and let stand for about 20 minutes before carving. Cut a cross on the flat side of each chestnut, with a sharp knife. Cover it with water and simmer, in a saucepan for about 5 minutes. Drain and remove the shells and inner brown skins. Cover it with fresh water and boil it for about 20 to 30 minutes till tender. To prepare the stuffing, melt the butter in a medium saucepan on medium flame. Add onions and celery to it, and cook till tender and mix in bread crumbs and chestnuts. Season it with, marjoram, thyme, savory, and rosemary. Rinse the turkey under cold running water, and pat dry. Massage salt and pepper into the body cavities and loosely spoon stuffing into body cavities. Seal the skin with skewers or kitchen twine, and tie the drumsticks together. Put the turkey on a rack in a medium roasting pan. Roast the turkey 3-1/2 to 4- 1/2 hours in the preheated oven, till internal temperature of thigh reaches 180 degrees F and stuffing reaches 165 degrees F.
Place a foil tent over the turkey during the last half of roasting time to avoid the over browning. Remove it from the oven and place on the platter and allow the turkey to stand for about 20 minutes before carving. In a bowl, whisk the eggs and add 1/3 cup pineapple and along with the ginger, mustard, pepper and the garlic powder. Now, add the bread crumbs and mix well. Next, crush and crumble the meat over this mixture and mix well. Transfer this mixture into an 8-in. x 4-in. x 2-in. loaf pan coated with nonstick cooking spray. Top this mixture will another tablespoon full of pineapple. Bake at 175 degrees C for one and a quarter hour or until a meat turns a nice golden colour. Let it stand for five minutes before serving. Meanwhile, in a small bowl, make a mix of onions, jalapeno, honey, lime juice, pepper and remaining pineapple. Serve with the meat loaf. Remove the giblets and neck from the turkey and reserve it for other uses, if desired. Rinse the turkey thoroughly with cold running water and pat dry. Add the water to a big stockpot, filling half full and stir in the maple syrup, pickling spice and bourbon. Add turkey and additional water to cover, if required. Cover and chill turkey for 2 days. Soak hickory wood chunks in fresh water for about 30 minutes. Prepare charcoal fire in smoker and let fire burn for about 20 to 30 minutes. Remove the turkey from the water, discard the water mixture and pat dry. Cut carrot and celery in half diagonally. Stuff the cavity with carrot, onion and celery. Pierce the lemon with a fork and put it in the neck cavity. Combine salt and pepper and massage the mixture over turkey. Fold the wings under, and tie legs together with twine, if desired. Drain the wood chunks, place on coals and put water pan in smoker. Add water to depth of fill line and place turkey in the middle of the lower food rack. Cover with smoker lid and cook for about 6 hours till a meat thermometer inserted into the thickest portion of turkey thigh registers 180 degrees F.
Add additional water, charcoal, and wood chunks as required. Remove the turkey from the smoker and let stand for about 15 minutes before slicing. 1. Preheat oven to 325 degrees F. Remove giblets and neck from turkey; reserve for making Pan Gravy. Rinse turkey with cold running water and drain well. 2. Fasten neck skin to back with 1 or 2 skewers. With turkey breast side up, fold wings under back of turkey so they stay in place. 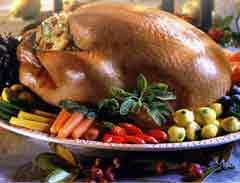 Depending on brand of turkey, with string, tie legs and tail together, or push drumsticks under band of skin, or use stuffing clamp. 3. Place turkey, breast side up, on rack in large roasting pan. Rub turkey all over with salt and pepper. Cover turkey with a loose tent of foil. Insert meat thermometer through foil into thickest part of thigh next to body, being careful that pointed end of thermometer does not touch bone. Roast turkey about 3 3/4 hours; start checking for doneness during last hour of roasting. 4. While turkey is roasting, prepare giblets and neck to use in Pan Gravy. 6. When turkey is done, place on warm large platter; keep warm. Prepare Pan Gravy. 7. To serve, garnish platter with fresh herbs and grapes. Serve with gravy. Remove skin from turkey before eating, if you like. In 3-quart saucepan over high heat, heat gizzard, heart, neck, and enough water to cover to boiling. Reduce heat to low; cover and simmer 45 minutes. Add liver and cook 15 minutes longer. Drain, reserving broth. Pull meat from neck; discard bones. Coarsely chop neck meat and giblets. Cover and refrigerate meat and broth separately. To make gravy, remove rack from roasting pan. Pour pan drippings through sieve into 4-cup measure or medium bowl. Add 1 cup giblet broth to roasting pan and stir until brown bits are loosened; pour into drippings in measuring cup. Let stand a few seconds, until fat separates from meat juice. Spoon 2 tablespoons fat from drippings into 2-quart saucepan; skim and discard any remaining fat. Add remaining giblet broth and enough water to meat juice in cup to equal 3 cups. Into fat in saucepan over medium heat, stir 2 tablespoons all-purpose flour and 1/2 teaspoon salt; cook, stirring, until flour turns golden brown. Gradually stir in meat-juice mixture and cook, stirring, until gravy boils and thickens slightly. Stir in reserved giblets and neck meat; heat through. Pour gravy into gravy boat. Pat the whole turkey cavity dry with paper towels, but make sure the outside of the turkey stays moist. Sprinkle the cavity with salt and freshly ground black pepper to taste. In a large saucepan, melt the butter or margarine over medium heat. Add the chopped onion and sauté until tender, but not yet browned. Add water, orange juice, orange rind, celery, the 2 tsp. salt, and poultry seasoning. Bring the mixture to a boil and add the rice. Cover, and remove from the heat source. Let stand for about 5 minutes, until the rice has finished cooking and absorbed most of the liquid. Stir in the chopped parsley with a fork, fluffing the rice as you mix in the fresh herb. Stuff the neck and body cavity of the whole turkey with the rice. Skewer the neck skin to the body of the turkey to seal the front. Lift the legs of the turkey slightly and bind with kitchen twine to hold, making sure the loose skin at the back of the turkey covers the cavity with the rice. Skewer the back side to hold the rice firm, if necessary. Place whole turkey, breast side up, in a shallow roasting pan. Cover loosely with aluminum foil and bake at 325-F degrees for about 4 hours and 30 minutes, or until a meat thermometer attains 180-F degrees in the thickest part of the turkey. Make sure to check the turkey about every half hour and baste as necessary. Remove the foil tent during the last half-hour of oven roasting to produce a golden skin. You may elect to baste with a mixture of melted butter and orange juice for an evenly crisp and golden presentation. In medium-size bowl combine turkey, celery, apples, walnuts, mayonnaise, yogurt, nutmeg and cinnamon. Cover and refrigerate at least 1 hour or overnight to allow flavors to blend. * To serve, arrange a lettuce leaf on a bread slice. Spoon 3/4 cup turkey mixture over lettuce leaf and top with another bread slice. Repeat with remaining ingredients. *NOTE: Turkey mixture will keep up to four days in the refrigerator. In 3-quart saucepan, over medium-high heat, saute onion and celery in margarine until vegetables are tender-crisp. Add broth, potatoes, salt, pepper and cayenne pepper; bring to boil. Reduce heat to low, cover and simmer 10 to 15 minutes or until potatoes are tender. Stir in turkey. In medium bowl, combine cornstarch and milk. Stir into soup and cook until thickened. 1 cup Swiss cheese, shredded. In 2-quart casserole combine rice with seasoning packet, water, mushrooms, artichokes, pimento and turkey. Cover and bake in 350 degree F. Oven 1 hour and 15 minutes or until liquid is absorbed. Top casserole with cheese and bake, uncovered, 5 to 10 minutes or until cheese is melted and golden brown. To make each turkey, place chocolate star, point side up, on work surface. Place one caramel on waxed paper; microwave on high for 5 to 10 seconds or just until slightly softened. Place softened caramel on tip of chocolate star, pressing down so they stick together. To make the tail, press chocolate cookie, striped side facing forward, firmly against the soft caramel to stand upright. Press candy corn on top of caramel to resemble turkey's beak. 12 cookies. Remove skin and bone from turkey; discard. Cut meat into 3/4-inch cubes. Put onion into a 3-quart round casserole. Cover with lid or plastic wrap. Microwave on 100% (High) 2 to 3 minutes. Or use 2 cups cooked turkey. Add meat, broth and garlic to onions; re-cover. Microwave on 100% (High) 5 minutes. Stir and re-cover. Microwave on 100% (High) 5 minutes. Add tomato sauce, paprika, caraway seeds and pepper; stir well. Stir uncooked noodles into casserole so that all noodles are below the surface of the liquid. Re-cover and microwave on 100% (High) 6 minutes. Stir, re-cover. Microwave on 100% (High) 6 to 7 minutes. Stir in yogurt or sour cream. Cover and let stand 5 minutes before serving. Given Below, are 3 preparations to stuff your roast turkeys. Choose as per your taste. In a large saucepan saute mushrooms and onions in butter for 10-minutes until wilted. In a large mixing bowl, pour sauteed ingredients over bread crumbs and toss lightly until moisture is consistent throughout the mixture. Stuff turkey and bake. Crumble the bread quite small. Melt the butter in a saucepan and add the onions and celery; cook until the onions are soft and beginning to show color. Stir in the bread crumbs, add the parsley and thyme, salt and pepper. Drain the oysters, reserving the liquor, and heat the liquor to the boiling point. If the oysters are large, cut them in half, if small, use whole. Add oysters to the liquor and cook until the edges start to curl. Drain promptly and stir the oysters into the bread mixture. Stuff your turkey with the mixture and bake. If it is difficult to get oysters canned in liquor, Substitute 1 can Oyster Stew, prepare as directed and add 1/4 tsp. Sage to your Stuffing. In a large pan sauté chopped onion in butter until soft. Add celery, broth, poultry seasoning, salt, pepper and water and heat to a boil. Place bread and parsley in a large mixing bowl. Pour sautéed ingredients over bread mixture and toss lightly until moisture is evenly distributed. Stuff well cleaned turkey with mixture and bake. tenderloins lightly with oil. Grill, covered, over medium coals or Broil 6 inches from heat source 15 minutes per side or until tenderloins are cooked through. Cut into 1/2-inch slices. Remove giblets and neck from turkey; reserve for other uses if desired. Rinse turkey with cold water and pat dry. Loosen skin from the turkey breast a bit not totally detaching. Place rosemary and sage under skin then smooth skin over herbs and back into place. Place apple celery and onion into the neck cavity. Place the turkey breast side up on a rack in a shallow roasting pan and brush with melted butter. Cover turkey loosely with a "tent" of aluminum foil. Bake at 325 degrees until meat thermometer registers about 180 degrees. This should take from 3 1/2 to 4 hours but begin checking after 3 hours. Remove turkey and let stand 15 minutes before carving. Serve with gravy. TURKEY BREAST BRAISED WITH GARLIC AND RICE. Preheat oven to 350.In 5-quart Dutch oven combine rice, broth, wine, parsley, rosemary, thyme, sage and bay leaf. Place turkey over rice mixture and sprinkle turkey generously with paprika. Cut off root ends of garlic cloves. Place whole garlic bulbs, cut-end-up, in rice around turkey breast. Cover top of Dutch oven with foil and lid. Bake at 350 degrees F. 2-1/2 to 3 hours or until meat thermometer inserted in thickest part of breast registers 170-175 degrees F. Allow to stand 10 to 15 minutes before serving. To serve, carve turkey into slices and place on platter. Spoon rice mixture into serving bowl. Squeeze garlic from skins onto turkey and rice. BARBECUED TURKEY WITH MAPLE-MUSTARD SAUCE. 12 whole black peppercorns (crushed). 1 13- to 14-pound turkey ,niblets discarded. Disposable 9x6 1/4x1-inch aluminum broiler pans. 2 tablespoons oriental sesame oil. 3/4 cup pure maple syrup, 1/2 cup dry white wine, 1/3 cup Dijon mustard, 2 tablespoons (1/4 stick) butter. Combine first 8 ingredients in very large pot. Bring mixture to simmer, stirring until salt and sugar dissolve. Cool brine completely. Rinse turkey inside and out. Place turkey in brine, pressing to submerge. Chill overnight, turning turkey twice. Mound charcoal briquettes in barbecue and burn until light gray. Using tongs, carefully divide hot briquettes into 2 piles, 1 pile at each side of barbecue. Sprinkle each pile with generous 1/2 cup hickory chips. Place empty broiler pan between piles. Position grill at least 6 inches above briquettes. Position vents on barbecue so that chips smoke and briquettes burn but do not flame. Preheat barbecue with all burners on high. Turn off center burner and lower outside burners to medium-low heat. Place generous 1/2 cup hickory chips in each of 2 broiler pans. Set pans over 2 lit burners. Place empty broiler pan over unlit burner. Position grill at least 6 inches above burners. Bring all ingredients to simmer in heavy medium saucepan. Brush glaze over turkey; cover and cook until thermometer inserted into thickest part of thigh registers 180°F, covering any dark areas of turkey with foil, about 1 hour longer. Transfer turkey to platter. Tent with foil and let stand 30 minutes. Serves 8. Disclaimer: Most of the recipes given here have been submitted by users, and we donot claim any gurantee of their performance, or ownership of them. You can submit your recipes by visiting our feedback page. If you have any issues over any recipes, please notify us.